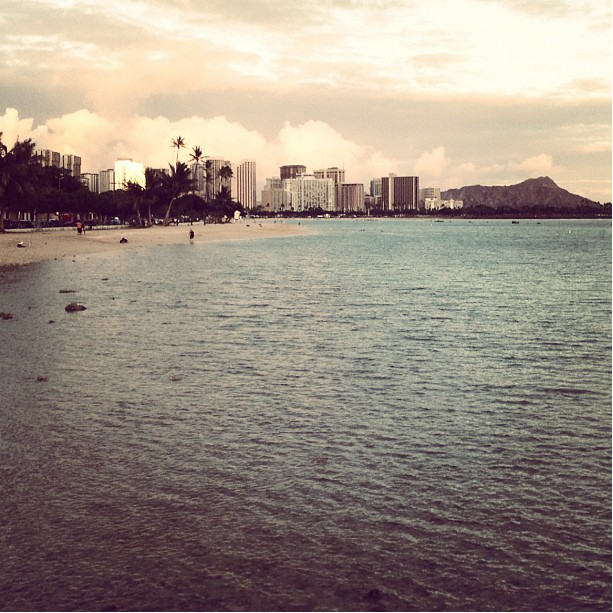 My favorite beaches in Hawaii? Waimea, Hanalei, and Lanikai are certainly near the top of the list, but I’ve got another favorite right here in urban Honolulu: Ala Moana Beach Park. I mean, what’s not to love? It’s got a golden sand beach, calm water that’s ideal for swimming or stand-up paddle boarding, awesome off-shore surf breaks, a jogging loop, a launching area for outrigger canoes, a beach volleyball area, tennis courts, plenty of grassy areas (and parking!) for get togethers, and a picture perfect view of Diamond Head. If you ever decide to visit during a trip to Hawaii, I have one crucial piece of advice: don’t go hungry. It’s pretty much inevitable that, even during a quick lap around the park, you’ll encounter the smell of heavenly BBQ at least half a dozen times. Next time I fail to follow my own advice and end up leaving the park totally ravenous and craving some grilled meat, this is the recipe I’m turning to. 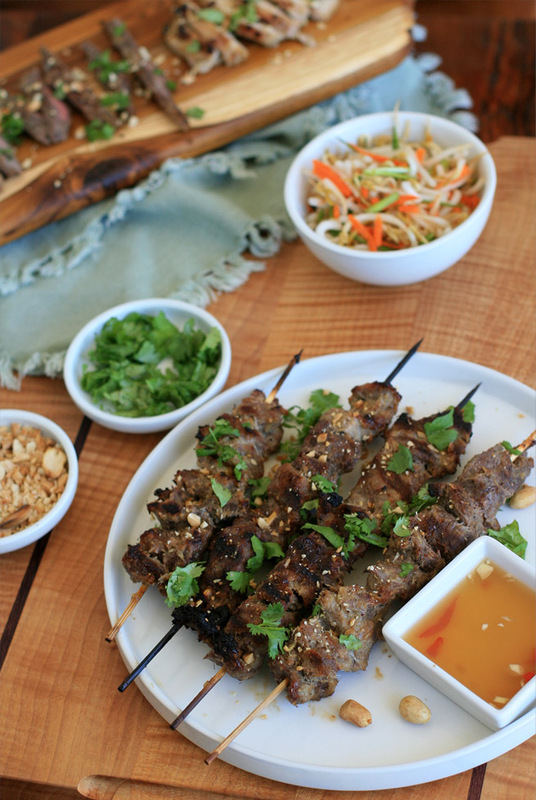 The potent lemongrass, fish sauce and garlic marinade means that the meat is ready to go in just 30 minutes. I tried it on beef and chicken and it was perfection on both. 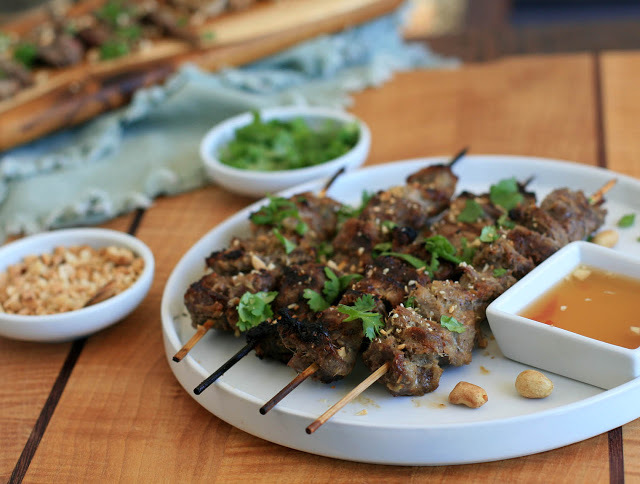 You really can’t go wrong here: the beef or chicken makes a great appetizer dipped in nuoc cham. 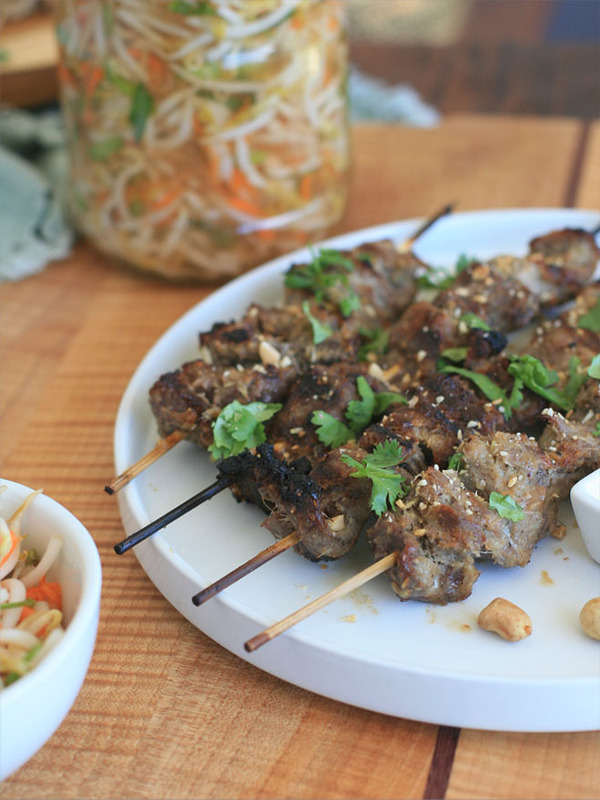 It was also great sliced up and tossed into a bowl of bun or served with rice and a Vietnamese salad on the side. 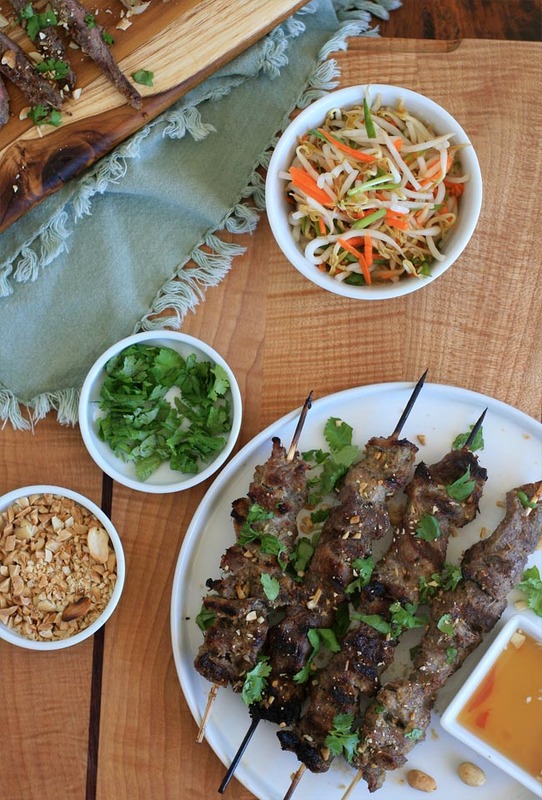 Even if you don’t want it to put together a whole Vietnamese spread, consider swapping out your standard steak for this lemongrass beef at your next backyard get-together… I wouldn’t be surprised if it became your new staple. In a food processor or high speed blender combine the sugar, pepper, garlic, lemongrass, fish sauce, oil, and salt and process until nearly smooth. Place the beef in a bowl or ziplock bag and pour the marinade over it. Toss to coat each piece of beef. Set aside to marinate for 30 minutes. While beef is marinating, preheat grill. Place the beef on the preheated grill (you can also thread the beef onto pre-soaked skewers, if desired). Grill for 1-2 minutes on each side. 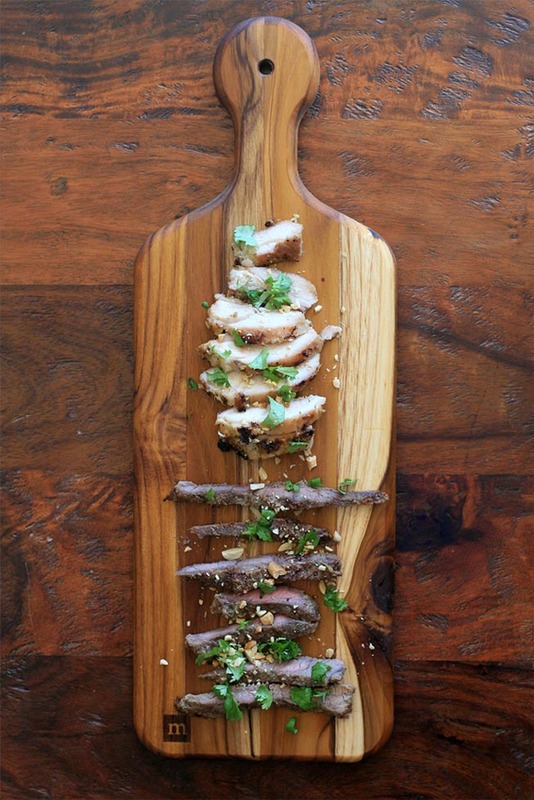 Slice beef (you can skip this step if you’ve used skewers) and transfer to a serving platter. Drizzle with any accumulated juices and sprinkle with chopped cilantro and crushed peanuts.